Airline Transport Professionals (ATP) today announced the delivery of two new Frasca CRJ-200 Flight Training Devices (FTDs) to its Arlington, TX campus. ATP’s CRJ-200 FTDs are more than just cockpit procedures trainers. 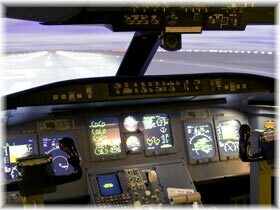 These FAA approved training devices fully implement all systems on the CRJ-200 aircraft. Combined with a visual projection system, the training device offers maximum realism. The FTDs will be utilized to introduce students in the Regional Jet Standards Certification program to Swept Wing Jet Aircraft flying, systems and navigation in order to prepare pilots for fast paced airline training. ATP has an additional two CRJ-200 FTDs at its Jacksonville Beach, FL training center and the company will accept delivery of one new CRJ-200 FTD at its Phoenix, AZ location in the near future. ATP currently delivers more pilots to the regional airlines than any other single flight school, college, or academy. The company is successful through the efficient immersion of students in multi-engine airline-style flight training over a short time frame. The benefit for the customer is the best training on the market at an extremely competitive price. The training received in the Frasca CRJ-200 FTD helps ATP ensure that its graduates are the most qualified commercial pilots entering the job market. In 1984 ATP pioneered accelerated, professional multi-engine flight training with an emphasis on pilot career development. Today ATP’s Airline Training Programs prepare pilots for airline careers with nationwide flying experience in multi-engine aircraft. Airline hiring partnership letters with 10 leading regional airlines recognize the value of this experience, by offering ATP pilots specially reduced flight time minimums for airline employment, enabling pilots to reach their career goals faster. ATP flies over 5,000 hours and provides more than 300 FAA pilot certifications each month at 20 locations nationwide.